One month ago, I wrote two blog post on Lippo Malls Retail Trust (LMIR). The first post is on their challenging acquisition of Lippo Mall Puri. This would likely be finance by a mixture of debt and equity. The historical dividend yield, prior to the announcement, was around 10%. This purchase, with income support, is not going to be dividend yield accretive. Subsequently, some readers have questioned whether we should be using the historical dividend per unit of 2.05 cents in our analysis. After all, the dividend per unit for the last quarter, if you annualized it, is only 1.20 cents. If we use this DPU, the annualized dividend yield is only 6%. In my article, I argue that business is rather consistent in Q3 and Q4, and there should not be such a huge change in DPU. My analysis leads me to conclude that the drop between Q3 to Q4 was due to a huge foreign exchange realized loss. I think that the dividend would moderate. And yesterday, LMIR announced their Q1 2019 results and DPU is backed up to 0.55 cents. Annualized it, and we get 2.20 cents. This is even better! We breached 11% dividend yield. I think not much was revealed about the reason for the big foreign exchange difference but from the results, things seemed to have gone back to normal. This was due to an exercise to repatriate excess cash from subsidiaries back to Indonesia. Lippo Malls have 2 issues in the past year. The first one was the increase in taxes that they have to incur, that used to be borne by their third party service manager. The second was the foreign exchange. Let us look at the updated figures. The table above shows LMIR’s updated revenue and net property income in Rupiah. 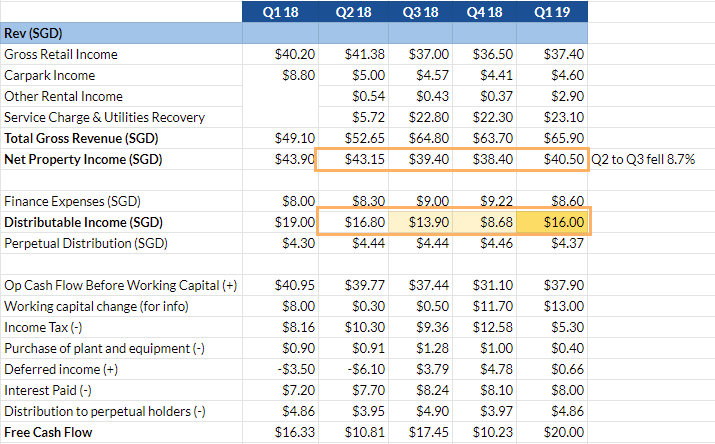 You realize the latest 2019 Q1 figures are not too different from Q2 and Q3 2018. This illustrates the short term stability of the operations. Next we take a look at the updated SGD figures, including the distributable income and free cash flow. We can observe a drastic increase in Realised loss on foreign exchange in Q4 2018. This has gone back down in Q1 2019. How should we look at these currency exchange volatility? My thinking is that for some reason there was a liquidity crunch somewhere and LMIR have to funnel money back to Indonesia, despite all the prudent hedging planning that they carried out. The Realized loss on foreign exchange, Realized loss/gain on hedging contracts and unrealized gain/loss in hedging contracts was so drastic in Q4 2018. This gives me the feeling that something forced their hands into throwing the planning aspect out of the window. Using somewhere close to the annualized Q3 2018 DPU for forward estimation looks to be correct at this point. Investors should note that despite all the hedging that can be done, no matter how long, if the currency movement is one way ( up or down), at some point, there will be a major tilt in DPU. You cannot run away from it. Hedging smoothed out volatility does not magically make currency depreciation or appreciation disappear. For REITs with mainly overseas asset, we should realize that in the past SGD have been very strong, so there is probably a build in 1-2% premiums required to take on these overseas assets. If a local equivalent REIT yields 5%, and the overseas REIT yields less than 7%, perhaps the REIT is not as attractive versus the local ones. This can be tough to judge. A more sensible way is to also compare to the risk free 10 year government bond yield for the country. You could take this off Investing.com World Government Bonds section. The chart above shows the yield change in the 10 year Indonesian Government bond rate. 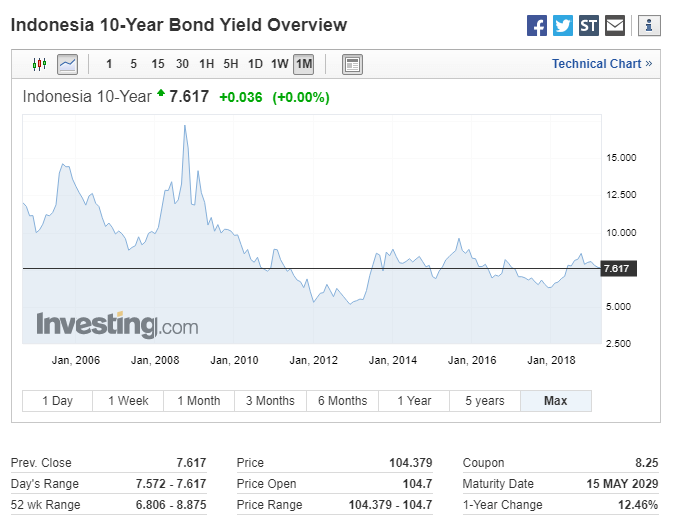 While SG 10 year is at 2%++, in Indo its closer to 7.6%. Whatever it is, at a dividend yield of 11%, its hard for Lippo Malls to make dividend yield accretive acquisition. It certainly means that as shareholders, we have to “eat” Lippo Malls Puri no matter whether it taste nice or not. There will be the investors that warned us not to buy the high yields. And they might be right to warn that. But I think it might be more worthwhile for us to investigate what are the conditions that make LMIR a good investment (don’t confuse this with a good stock). And perhaps this is a good template to see what would make LMIR a good long term hold. If we considered #1, the recent actions done by the Sponsors and Manager does not generate any comfort. There are potential for acquisitions but with the share price at this level and trading at this dividend yield, any purchases are not going to be accretive. The best thing to do is to operate existing malls well to generate confidence, so that the share price can be rated higher. This is a negative here. For #2, we would have to see whether there are tailwinds or headwinds for the Indonesia economy, and the retail sector. I am not an expert in this, so am not going to pretend to be one. What was a depreciating Rupiah situation turns. The distributable income growth will be great. Finally for #3, the evaluation has to take into consideration #1 and #2. A 11% yield versus even a 7.6% government bond rate looks great, but if going forward #1 and #2 is not favorable, you wonder if its worth it. There will be a certain dividend yield you would accept to take on this investment risk. I were in this position I would seriously look whether the economy provides a great tailwind. I write a free section teaching you guys the nuances of investing in REITs. The link is below. After the large DFA article last week, I do not really feel like writing a lot of stuff. There is probably a lot of other stuff I need to catch up upon then to do one humongous article every week. So this week one is a little breather. It is some numbers that I ran some time ago. I think I decide to bring it out. There is emerging trend of experts teaching folks to build wealth with the aid of leverage. Leverage means, using other people’s money, in a lot case the banks money, to aid you in building your asset base. You have folks like Kim Eng who is able to give to loan you currently a 3.28% interest rate loan on your shares. This enables you to buy shares more than you can afford to and speculate on them. When you earn as you sell off the shares, you earn a lot more. Conversely, if you lose as you sell off the shares, you lose a lot more. Now, the idea for a lot of people is not to do leverage irresponsibly. We all want to do the sensible thing, but to make use of what is available to us so that we can accelerate our wealth building. So basically, rather conservative wealth builders wish to use leverage to step up and build their wealth. It makes me wonder how conservative we are. We are going to invest in good blue chip stocks and Real Estate Investment Trusts (REITs). And we are going to choose to invest in 1, or more of these, to form a portfolio that gives us a 7.5% per year compounded rate of return (hypothetically). If you want to take a look at whether its achievable, you can take a reference on the dividend yield that you can get on my Dividend Stock Tracker. Those are dividend yields, and do not show the future compounded growth rate. The growth rate can be +2 to 5% or -2 to 5%, depending on which you choose. Not all stocks are appreciating over time. Let’s say we make use of Kim Eng’s margin financing which enables us to invest in selected stocks and REITs at a rate of 3.28% (this rate used to be 2.88%. When the global interest rate moved up, it also gets shifted up. This gives you an idea that these rates do not stay stagnant). According to the strategy, we want to use leverage to build up our financial assets. However, we do not want leverage to kill us. So at some point, we will pay back the debt. The strategy is touted to be able to let you build up your asset base. So it is suitable for those folks in the initial years of wealth building. Every year you contribute $2,000/mth or $24,000/yr from your disposable income to this leverage portfolio. That is $24,000/yr of your own money. On top of this, through Kim Eng’s financing, they lend you $24,000 more to purchase more assets in your leverage portfolio. There is an interest cost on this $24,000. As you build up your leverage/debt/liabilities/margin, your interest cost increases. 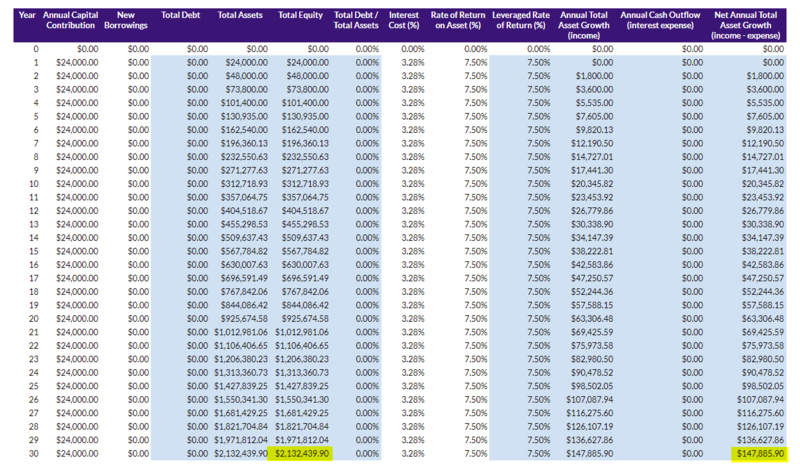 At some point, instead of using that $24,000/year to buy more stocks in this leverage portfolio, you use this $24,000/yr to pay down the leverage. What you will end up with at the end is an unleveraged portfolio, or one that is entirely your own equity. The total capital you put into the portfolio in both leverage and unleverage is the same. I think 15 years is a good time frame. If you are in a good job and you can put away $2,000/mth at 26 years old, 15 years will take you to 41 years old. A relatively young age. We first take a look at the numbers without using leverage. The table above shows the asset, debt and equity change over 15 years. It also shows us the net annual total asset growth over the 15 years. We have probably contributed $24,000 a year for 14 years. Our assets grow from $0 to $543,784 in year 15. Any return we have, we reinvest into the portfolio. So for example you can see the net annual total asset growth to be $1,800. We can cash flow this and spend this in our daily expenses. But we do not do that, we reinvest back into the portfolio to grow it. Since there is no debt, total assets – $0 debt = total equity. So Assets = Equity. Also since there is no debt, there is no cash outflow as interest expense. 15 years and you can build up without leverage and get $3,185/mth or $38,222/year is pretty good! Of course this is hypothetical that you earn such a consistent 7.5% on your total assets. In reality, your returns goes up and down. If you see a fund that gives you 7.5%, 7.5%, 7.5%, 7.5%… run from it. Most likely it is a scam. Now let us juice up the portfolio by taking on 100% more assets using margin. Then at the 8th year, we start using our $24,000/yr to pay off the margin. At the end, we should have zero debt at the end. I have tried to put some explanation on the data so hope that helps. We spend 7 years using leverage to build up an asset from $0 to $380k. Then the asset grow on its own with the net annual total asset growth to $615k in the 15th year. From year 8, we use our $24,000/yr to pay down the debt. So using this strategy, we reached our objectives 2 year in advance. Not sure about you, but that does not look like something real big. Unless I really hate my job. Now let us compare the total equity growth side by side. Somewhere after the 6th year the equity of the leverage portfolio starts deviating from the unleverage one. The chart above shows the cash flow or the net annual asset growth increase over time. 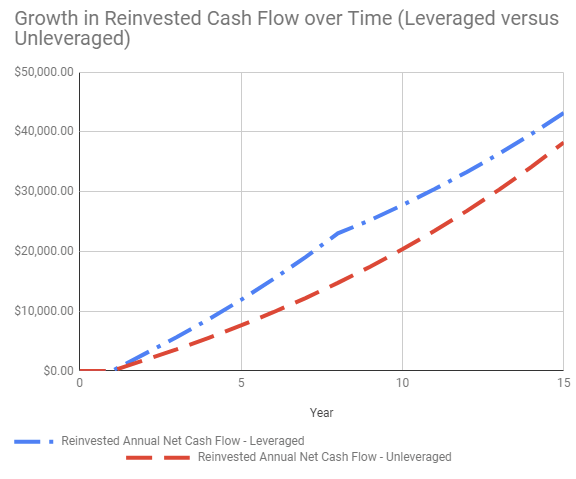 Notice the great boost of building up more assets for the first 7 years giving the leverage portfolio a $19k/yr cash flow versus $12k if its unleveraged. Then as no more assets are added, the pace of the growth slowed down. 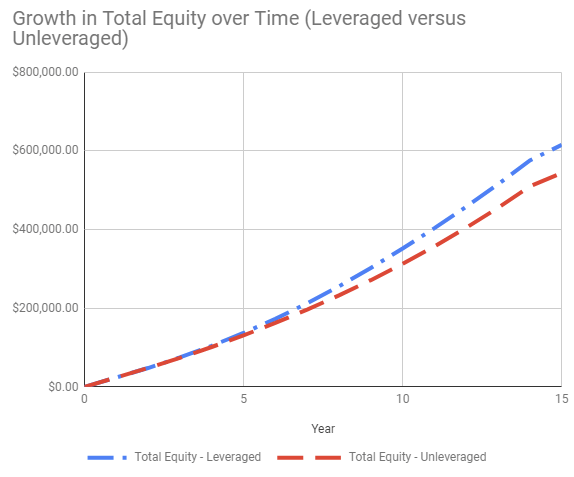 The unleveraged portfolio maintain its pace and eventually came close to catching up with the leverage portfolio. Both your capital outlay is the same at $336,000. I suspect that if we do it over a longer period, the leverage portfolio will show its quality. So instead of 15 years, let us do it for 30 years. Instead of paying off at year 7 we start paying off at year 16. The leveraged portfolio builds $561,000 more than the unleveraged portfolio (26% more). The leveraged portfolio eventually gives $40,000 more in annual cash flow. (27% more). As I have said, your returns do not go 7.5%, 7.5%, 7.5%, 7.5%, 7.5%……. In reality they go up and down if we are talking about total return. 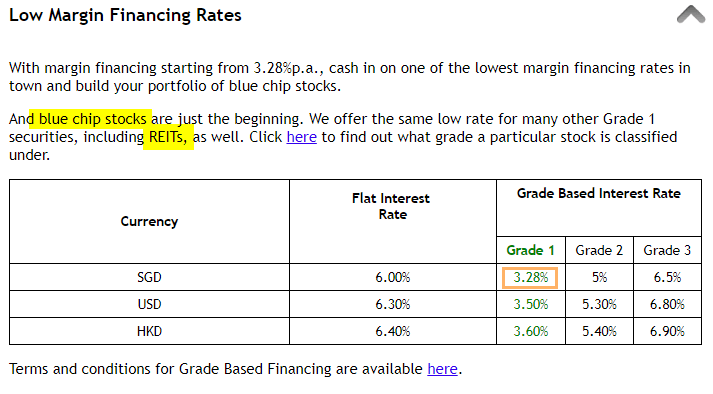 So this 7.5% for REITs can be the yield, but we can always look at it as a total return. This means that you invest in a portfolio of REIT that gives you an average of 5.5% yield and a 2% compounded growth for a total return of 7.5% per year. Now lets add a bit of sequence of return volatility into the picture. 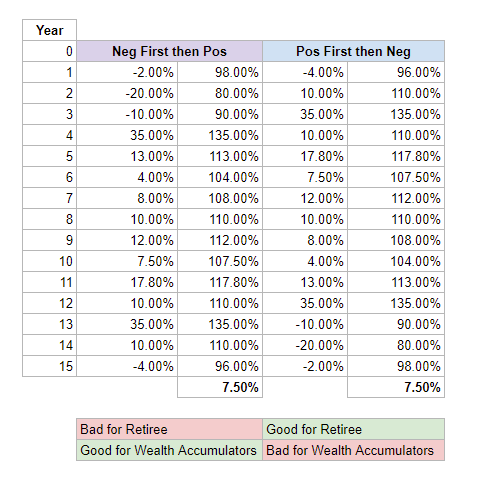 I explained more about how a negative sequence of return can affect your retirement. Basically, your returns over 15 year, 30 year can be of different sequence, and they affect your portfolio based on your objectives. In the table above, I created 2 set of sequence. The first set is one where we have more negative returns first, follow by positive. The second one is more positive then negative. If you look at the end result, both provide a 15 year compounded average rate of return of 7.5%. The first sequence is bad for retiree. It is why I went through so much writing on retirement. To hedge this risk. However, this negative first follow by positive sequence is good for the wealth accumulator! You get to accumulate more units when you are young. When you have more units, then when the bull market come later on, your wealth will grow. For the leverage portfolio, I would expect this sequence to be favorable. The second sequence, is good for the retiree but bad for the wealth accumulators. So you can see the irony: If you have accumulate well and ready for retirement, you might be in the worst position as the negative sequence is coming. On the flip side, if you have struggle to accumulate for retirement due to poor returns, but you manage to get the amount you need, your retirement might be much smoother! The assumption here is that market move in cycles. So what I said previously checks out. If you are accumulating, it is better to have more negative years and then positive years. Now let us take a look when we applied leverage to it. Seems the dangers of leverage did not kill the portfolio. The negative first then positive sequence built $300,000 more wealth. Compared to the unleveraged portfolio which is $210,000 more only. The positive then negative sequence was weaker but not by much. Now let us take a look at the portfolio debt to asset to see whether, at any point the portfolio is in danger. I think this debt pay off thing might be working out. However, notice that when the -20% and -10% came in the debt to asset went above 50%. The debt is more than the equity. Now I wonder whether if some of the stocks went down more on an individual basis, it will result in a margin call event. In those events, either you top up the equity to restore back to a maintenance margin ratio, or the broker force sell your assets. Selling off at a low price. That might set your wealth building back for some time. I think whether this becomes a grave event or not depends on the amount of capital contribution. In those two years, although the net annual total asset growth was -10k and -11k respectively, the capital contribution and new investments dwarf that amount. Your asset base have not gotten large enough. It will take a few years for the new capital contribution to make up for those losses. 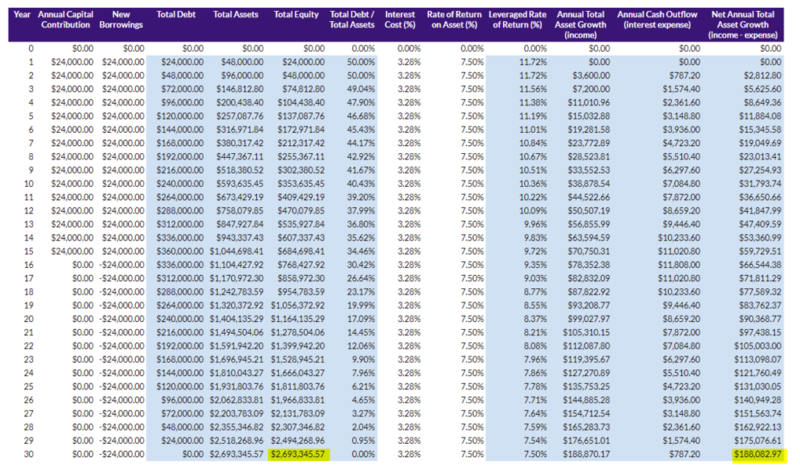 Leverage in this sequence did not kill because by the time the -10% and -20% returns come in, the amount of debt left is only $24,000 compared to an asset size of $833,937. You just faced the prospect of -$230,000 reduction in your equity base. Depressing yes, but it does not kill you. If you think about it, this deleveraging is pretty similar to how you move more of your portfolio to bonds as you approach retirement (read How Traditional Portfolio Allocation Strategies Can Alleviate Large Market Plunge Fears). Instead of moving to bonds, in the case of leverage portfolio, the debt is being reduced so that as you approach the twilight of your wealth accumulation, your credit risk is reduced. Notice also that since this is an all equity portfolio, and as you approach retirement for example, a -10% and -20% return would shave a large part of your portfolio. This investor took care of the credit default risk, but didn’t take care of the portfolio and retirement risk. What if we didn’t Deleverage, but also don’t Leverage too Much? Now since I went down this rabbit hole (and fxxk I wasn’t suppose to write so much! ), why not build on the last sequence of return experiment and see if we do not deleverage? The first table shows the positive to negative sequence. Notice that from year 8 to 14, the investor did not deleverage the portfolio. She adds to the assets instead. Observe that the total debt to asset gets a nice bounce from 17.51% to 22.39% from 14 to 15th year. That is a huge increase. However, because this happened at the end of the wealth accumulation stage, and that the assets have accumulated far more than the debt, that even with the huge increase, it is still manageable. For the negative to positive sequence, once you get past the tough year 3 to 4, the portfolio naturally deleverage from 50% to 14.5%. Not so much difference. Just for one you are free from debt one you are not. This article turned out longer than expected. I cannot write anymore. Should you leverage up? Is there an advantage to doing this? Are the trainers trying to sell you a pipe dream? The guys came up with a strategy, and you should understand that different parts of the strategy try to make this a success. Don’t go implementing this just because you understand part of it and do not understand other part of it. There are alternatives to this: Get better in your stock investing! You might not need to bother with things like this. I always find that leveraging up are people attempting to invest with something conservative, but putting on more risk on something conservative. It depends on which poison you prefer. Again, this strategy is based on a consistent capital injection. If it is a large lump sum investing, your mileage may vary! Let me know if some of my numbers seemed weird. I do make mistakes here and there. I realize in this research, some numbers lead me to believe that an unleveraged portfolio generates greater equity than a leverage one. Which mathematically do not make sense. So I am rather lucky to find my own error. If you are re-contracting your phone plans in recent months, you would have observed that your data bundle have gotten real attractive. This is probably the result of intense competition due to entry of a 4th telecom operator TPG. Before, they start offering their paid package, and as they are testing out the quality of their network, the incumbents are starting an intense price war. Not just that, the mobile virtual network operators (MVNO) such as Circles Life, Zero, MyRepublic and Zero1 are also offering some really competitive packages. As a consumer, this is a good thing because these corporate tyrants are finally kowtowing to you at the expense of their margins. What I do find refreshing is that the MVNO operators are catering to selected usage segments that the incumbents do not wish to address. I could get a S$9/month Zero1 plan for my dad who do not use his phone so much since most of the time he is at home. The illustration above was taken from a Telecom operator stock review. It shows the kind of upgrades that you could get if you re-contract to a sim-only plan. DBS is forecasting that perhaps only 6% of the Singapore customer base would switch over to sim-only plans. From the upgrades on offer, the price have been kept within range. What got bumped up was the amount of data. If you are on an entry plan, you get bumped up 10 GB. Starhub even bumped up from a 10 to 16GB range to 40GB. I find that having more data, for the same price is kind of great. However, I do wonder what they are trying to do is to encourage us to make full use of that increase in data. If it is #2 then this greater amount of data is here to stay. However, if it is #1, then this might not be a good thing for consumers. Unless you practice some restrained, many might just find that they need to use as much of this data available as possible. So you venture and carry out more of the experience that you cannot do in the past. You used to put video streaming on mobile off, now you allow them to be on for your Instagram, Facebook and other social platforms. Over time, your current usage becomes a habit, that you cannot do without. Would there come a time where the telecom competition equilibrium is reached again and all the telecom stop providing free data incentives, and make you pay for it? Would you be able to scale down your usage immediately? Personally I think the network should be able to accommodate more data usage than in the past, so they are giving us more, of what they tried to constrain and make us pay a premium in the past. 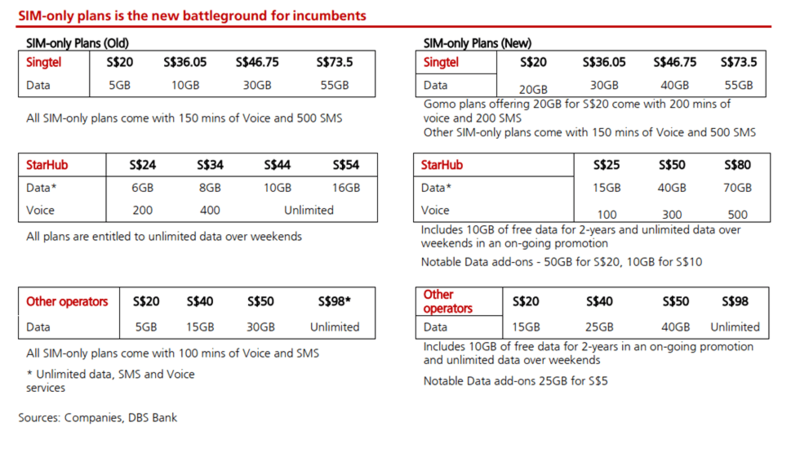 In the event that competition stabilized, it will be tough for one or two (probably Singtel) to make you pay for the data. Some of the MVNO will just entice you with more data. I think overall it is whether technically and economically, they can continue to do something like that. This article might sound like a Telecom analysis, but what I would like to warn is more on the personal finance side. For some people, when there is a tendency for things to be offered for free, they tend to change their behavior and over-consume it. This means that had there be a cost to it, you would not behave this way. Basically, we do not practice some self discipline or be in tough with what we think is enough. Do we then blame the telecom for seducing us with such temptations? I think it is imperative to use things within your means. And be in control of yourself. More indulgence in entertainment and convenience is OK but don’t become a slave to it. In Dec 2017, Chinese conglomerate HNA Group acquired all shares of CWT Ltd to successfully acquire CWT for S$1.399 bil. Since they were acquired, CWT has been combined with other assets and listed as CWT International and subsequently listed in HK. Yesterday, CWT International said it defaulted on a S$179mil loan and it has less than 24 hours to pay the funds or lose assets pledged as collateral. They have not paid accrued interest and fees worth HK$63 mil to lenders. The lenders will take possession of the assets if the amount due is not paid by 9 AM on Wednesday. The assets that are pledged under the loan facility includes CWT International’s 100% stake in Singapore based CWT Pte Ltd.
CWT’s operations could be impacted and potential breach of loan covenants if CWT International’s lenders enforce security. If the lenders take over CWT Pte Ltd’s operations, their business could be affected. Since they have been delist, the impact to Singapore shareholders is less. The greater impact are the companies who own properties that are leased to CWT. CWT is a major logistics player, and a few local REITs have them as a major tenant. They include Aims APAC REIT, Cache Logistics Trust and Mapletree Logistics Trust. It is all well and good that they have security deposits. Do note that, CWT have not stop paying rent. The worry would always be, how easy or how in demand is it to rent out these spaces after the security deposits have been used up. As I written here in the case study of Soilbuild Business Space’s Technics and Boustead Project’s Ausgroup, some premises, when demand is lower, and very special specs, is pretty hard to rent out. The impact to Aims Amp, Cache and MLT will depend on the % of property CWT Pte Ltd is using themselves versus sub-leasing out. For example, about 30% of MLT’s lease to CWT Pte Ltd are leased to third party end-users which could be easily transferred to MLT. The other 70% sub-leased to regional and international logistics company may still be around and serve other logistics player. If the factories are high spec, they might be in demand. If not, then the REIT may encounter some issues. There are more in-depth articles on REITs in my Learning about REITs section.